In the business document world, a work-flow is simply the path your paperwork follows through its lifecycle. A paper invoice is received in your company by Jane in logistics. Jane scans the invoice to her desktop, and names the file. Jane then emails the scanned file to your Accounts Payable department where it is received by John. John prints the attachment and processes the invoice. John pays the invoice via check and files the invoice along the with the printed payment documentation in a vendor file in a file cabinet. This is a fairly simple work-flow. It is likely that your company's invoice work-flow has many more steps including approvers, and purchasing departments & POs. 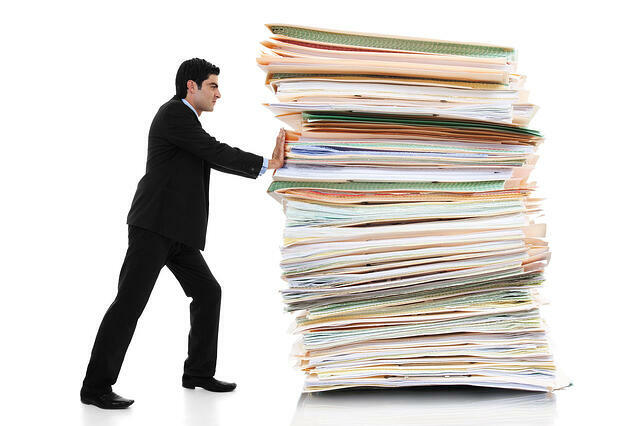 We have seen invoice processes take more than 15 steps!!!! All of your paperwork processes have grown up organically over time and were "designed" by the people processing your paperwork. These folks may be great at their roles, but are not experts in document efficiency. Most companies have simply kept their process from the early days and added more bodies to deal with the inefficiencies. The worst part is you don't even know your processes are inefficient!!! There are lots of efficiency solutions in the business technology world that address these problems. Many of these solutions come standard on the equipment that is already supporting you. The right partner will know how to maximize technology solutions to improve your document processes and make your processes scalable. When vetting technology partners, look for creative problem solvers. Sometimes there may not be an out-of-the-box solution to address your unique challenges. How hard does your vendor work to solve your business challenges? Having a support partner that goes beyond the basics makes all the difference to your team and to your bottom line. To learn more about improving your document work-flow, drop us a line here.